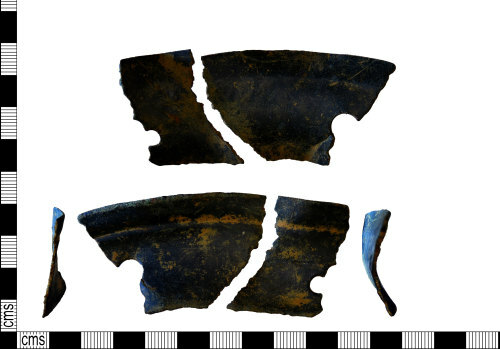 Medieval copper alloy vessel rim, 73mm long, 32mm wide, 2mm thick and weighs 21.36grams. The object consists of two joining fragments of a vessel rim. The rim is marked with an indented line, c. 10mm in, running parallel with its edge. each fragment has the remains of a circular? hole punched out of it, possibly to accomodate a handle.